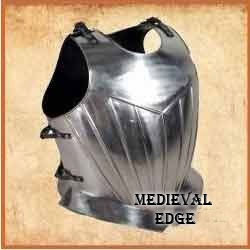 Muscle Breast Plate Cuirass., This Full Plate Armor is handmade from 18 gauge high carbon polished steel. It comes with the muscled breast plate and a shouldered back plate. Both plates have leather straps and metal adjustable buckles so this beautiful piece can be worn. Inside is enameled black for ease of upkeep.